The quest for the simple farm life has experienced a boom recently, both in the media and in computer games (e.g., Farmville), which allow those of us who haven't moved to farms to still grow lettuce in the city, keep bees, or at least care for virtual sheep, pigs, and wheat fields. The Czech game developer Hammerware produced a 3-D real-time strategy game called Family Farm back in 2011 and won a national award for it. Now the game's successor, Goodfolks, has hit the market. The new game is different in many ways, but it still runs natively on Linux thanks to the open source engine Ogre3d (see the "Installation" box). Ubuntu and Xubuntu 12.04 and 12.10 users will have no problem. Simply purchase Goodfolks with your credit card or PayPal in the Ubuntu Software Centre. Even the Desura games platform offers Goodfolks, or you can buy the game directly from the website . Goodfolks installed flawlessly in Kubuntu 12.10. Purchasers get an archive to unzip via the file manager. Double-clicking the Goodfolks file starts up the game. Intel users, however, are out of luck because Goodfolks, like its predecessor, runs only on AMD/ATI and NVidia graphics cards with their proprietary drivers. 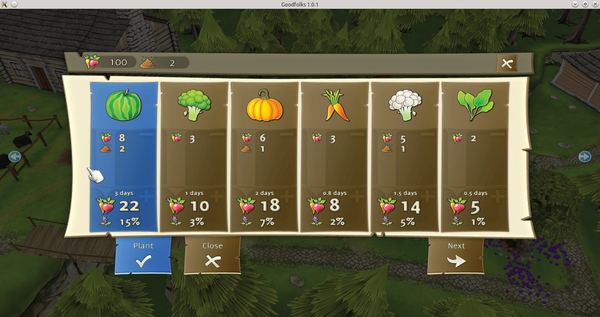 The "Family Farm vs. Goodfolks" box describes the main differences between the two games. Numerous differences exist between the two games and mainly involve the course of the game. 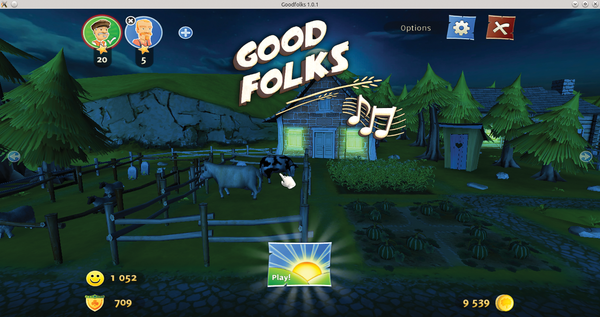 Whereas Family Farm had a vertically scrollable playing field with a single main building that you could gradually add on to, Goodfolks has a horizontal playing field, and you move using arrow keys to the left or right. This approach takes a moment to get used to, but the simultaneous use of mouse and keyboard leads to a pleasant gaming experience. At the same time, the pretty graphics remain throughout; in the previous game, these moved a bit into the background during tactical zooming movements. A few other details were dropped from the original game. Lunch breaks don't take as long because characters no longer need to be assembled at a central location; however, you do need the farm products to cook meals. Hungry farmers aren't working but are just sitting about. Animals need their feeding time, too. And, in Goodfolks, instead of one building, you have a number of houses (or cottages) that you need to renovate and unlock. This addition not only increases the area under cultivation, but introduces some new people into the virtual town to give it some life. Children are as rare as migrant workers in the new game. The farmers also no longer have individualized skills (cooking, field work, etc.). In the previous game, you could build on the particular skills of a farmer, but this is no longer the case. In Goodfolks, whoever arrives first does the work, and that's it. The growing and harvesting cycles also disappear, therefore, so do the seasons. Planting and harvesting are ongoing. What especially caught our attention is that Goodfolks no longer has a specific goal. You don't have to accomplish horse breeding within six years, earn a lot of money, or build a perfect house. You can unlock tasks for each new level, and there are always new minor goals to achieve. Goodfolks differs from its predecessor in that the game is now open ended. According to Hammerware spokesman Martin Prochazka, the open-endedness was a request from fans; however, players can discover or unlock new things at each level. Once you've achieved a level, there's an end sequence, but you can always continue playing. If you want to start again, you can simply choose another character (Figure 1), which puts you at level one again. Figure 1: After a game ends, you wind up at the main menu, where Goodfolks stores your previous progress. The main menu also provides certain technical options, such as full-screen mode. So, who are these good folks? Play starts with a farmer and his wife with fields in front of their home, cultivating vegetables and wheat, raising animals, eating, sleeping, and working some more. With the money they earn, they buy new houses, clear the woods of trees, and expand their property. Each new home has a new owner, and the village eventually becomes populated. Once you achieve all the tasks, you'll reach the Goodfolks end sequence. The challenge for players is to build up the food chain and keep things in balance. You need to grow vegetables and wheat, produce food from them, and increase the yield to include the animals (Figure 2). Figure 2: Cows produce milk and valuable manure, but they need to be fed. For example, cows need vegetables regularly, and sometimes herbs if they get sick. Consequently, they produce milk and quite a lot of manure. The manure in turn serves to increase vegetable yield. Six units of vegetables and two units of manure help to produce a field producing 22 units of vegetables, enough to feed all the animals and prepare meals for the farm families. If you don't feed the animals after a few rounds, they'll die. If you breed sheep, you can harvest wool, which is a valuable commodity. The general goal is to strike a balance between cultivating raw material and producing things to sell. 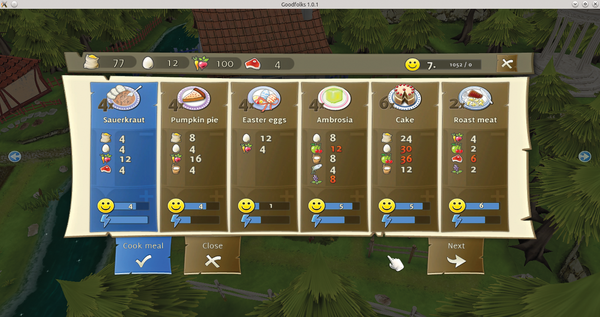 You'll notice the main Goodfolks task controls in Figure 2. 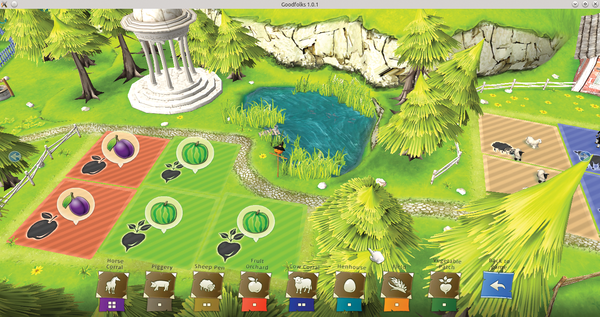 At the bottom right is the field planner where you can drag and drop what you want to plant in a field. Depending on the level achieved, different options are available. Apart from the kind of field to cultivate (wheat, vegetables, sheep, etc. ), you also see how many tiles it needs. A horse corral, for example, requires four tiles (Figure 3). Figure 3: More opportunities for applying tiles occur during the course of the game. A field is for grazing animals or growing wheat or vegetables. In the left bottom corner of Figure 2, you'll notice four control icons. Idle ones shows the currently inactive farmers, Tasks shows the number of incomplete tasks, Hungry ones shows the number of workers with empty stomachs, and Hungry animals shows the animals who need to be fed. If you click Tasks , a characteristic gray arrow appears that, for example, points to an empty field. Clicking the arrow causes the next free worker to run in and plow or harvest the field. If the number of tasks exceeds the number of idle workers, the game deactivates the gray arrows until a willing worker becomes available. If farmers have hungry animals, numbers appear in the corresponding fields. This warns farmers to feed them with vegetables or other foodstuffs – provided they're available – and with herbs if they get sick (see the "Herbal Remedies" box). If farm animals get sick, they need to be fed with a unit of herbs or they'll die within a few game rounds. Unfortunately, you can't plant herbs as you would wheat, but they grow as byproducts in fields. Among new vegetable or wheat plantings, you'll also see a blue herb (Figure 4) with a percentage figure. This figure indicates the likelihood that the given field will yield an herb byproduct. Watch out for the herb cultivation and best avoid cooking with foods requiring a lot of valuable herbs. Figure 4: The percentage figures at the bottom indicate the likelihood that the officially cultivated field product will yield herbs. 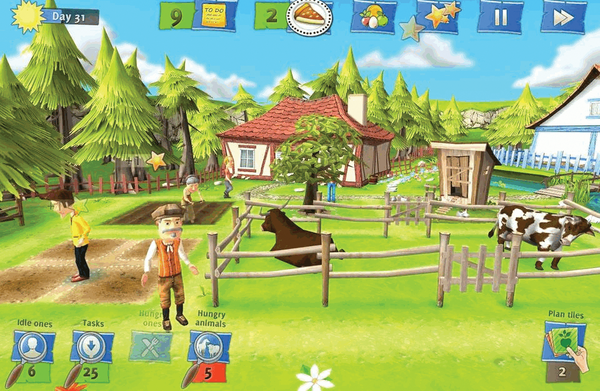 To prepare food for the hungry farmers, click the plate icon at the top of the screen (Figure 2); the game pauses a while at this point. You can choose from a number of different foods, depending on the given raw material (Figure 5). For example, to make a pumpkin pie, you need 8 units of wheat, 4 eggs, 16 units of vegetables, and 4 units of milk. Foods that have more nutritional value can satisfy more people; a pumpkin pie can serve four persons (and provide four satisfaction points), while roast meat can only serve two persons (and provide six satisfaction points). Many potential meals become unavailable when the raw materials for them, such as vegetables and wheat, are unavailable also. Figure 5: A pie can satisfy four workers but requires more raw materials. Preparing food takes varying time, although the process is much faster than in Family Farm. When you click the plate icon over the button for a hungry person, they begin to eat and can immediately begin work again. You can also prepare a meal in advance so that something in the kitchen can await a hardworking laborer. Be careful, though, not to use any scarce raw materials for meals.